If you play your cards right, churches can be among your most loyal customers. Many of them are in continual expansion mode, and if they feel like you take good care of them, you stand to be their go-to firm whenever they’re upgrading their facilities or building new ones. But while houses of worship may seem like a good bet, not all AV companies are cut out to work with them. For one, if you’re not into church, chances are that churches won’t be into you. Memo to AV companies: if you’re not into church, chances are churches won’t be into you. To gather this information, the CSD team is usually in contact with various members of the church. From senior pastors and worship leaders, the AV firm can gain a high-level perspective on the church’s vision, while conversations with the people who are actually going to be operating the AV technology can help systems designers understand, for example, how tech-savvy the end users are (which, in turn, influences things like system programming). Finally, to hammer out the nitty-gritty details of what specific equipment will go into the facility, CSD generally works with church tech directors. David Roche, project manager at media technology and integration company Diversified, said that his firm follows an intensive discovery process with churches before sitting down at the drawing board. He also noted that compared to those in other markets, church projects tend to have long lead times that sometimes last for years. “We very rarely have a project where somebody calls up and says, ‘Hey, we want to do new cameras,’ and we design it, spec it, go through all the processes, and have it installed in three or four months—that just doesn’t happen,” he said. One of the reasons for this is because many churches are ruled by committee, which means that AV firms can find themselves struggling to determine who actually has the authority to give a project the green light. Roche’s colleague Tom Larrison, account executive at Diversified, relayed that his first contact at most churches is the media minister or tech director, but these individuals don’t always hold sway over the committee that holds the purse strings. He will also try to meet, even briefly, with the key decision-makers, “but sometimes it is very difficult to get to that point,” he said. Ideally, Larrison will offer to make a presentation to the church committee directly. “They need a company to come in and help them understand, yes, this is very expensive, but this is why, and this is why you need to go with something like this,” he said. Carolyn Heinze (carolynheinze@free.fr) is a freelance writer/editor. Traditionally, production lighting rigs in churches focused exclusively on the platform. 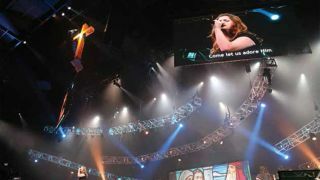 Doug Hood, president, Custom Sound Designs (CSD Group) noted that more and more, houses of worship are applying this technology to the entire auditorium to create an immersive worship experience.